From a student tour to slinging graphics and slaying displays, read how Dustin found his way to being our newest production artist. Hello everyone! I’m Jeni, the director of organizational development at McCullough Creative. I help get people hired and trained, organize benefit administration, and even write blog posts! 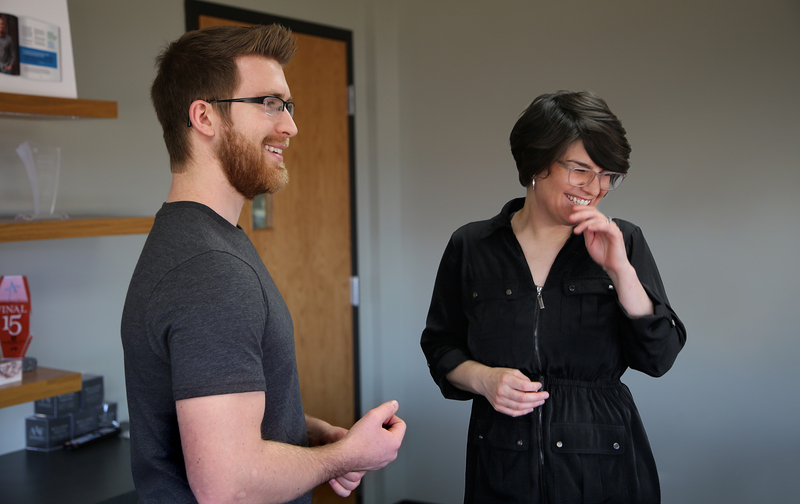 It’s something new every day—that’s life at a small business, and something our new hire, Dustin Kilburg, is getting to learn all about. He’s our newest production artist, and we’re excited for you to get to know him. Hey, Dustin, thanks for sitting down with me. I feel like I already know you so well from the hiring process, but it’ll be nice to catch up on how everything’s going so far. For the readers’ sake, why don’t you give a little background on your experience? Sure! Sounds like a good place to start. Well, I grew up just across the river and graduated from Southwest Tech’s graphic design program. [Laughs] I’m not actually that big into sports, but sure—on Wisconsin! After graduation, I took a job at Cabela’s in Prairie du Chien. And what’d you do there? Were you using your degree? A proprietary heat-applied process was used to fuse companies’ identities onto various merchandise products. Basically, you were getting great experience in skills you’ll use here, right? A good portion, yeah! Those skills are definitely handy, and I’m using even more of the skills and programs I learned in school, like Photoshop® and Illustrator®. It feels good to put that education to work. What other skills do you bring to the table that make you a good fit for the role? It sounded like my farming background was appealing. I grew up working on all kinds of different tasks with my dad—that’s a big part of what’s shaped me and keeps me growing. I love learning new things, I’m not one to sit still. So, I guess that handiness and being able to build something out of nothing is helpful. It’s definitely an aspect of the job I’m attracted to and have really been surprised by. Surprised? Tell me more about that. Well, I came through on a tour while I was still in school, and felt like I had a really good understanding of the company and what it does. Now that I’m here, there’s so much more we do than I realized! Almost nothing is outsourced—we’re literally taking that idea on a page and using raw materials to make the final product. I love that! I understood that was part of the job from the interview, but now I see how much more it involves. 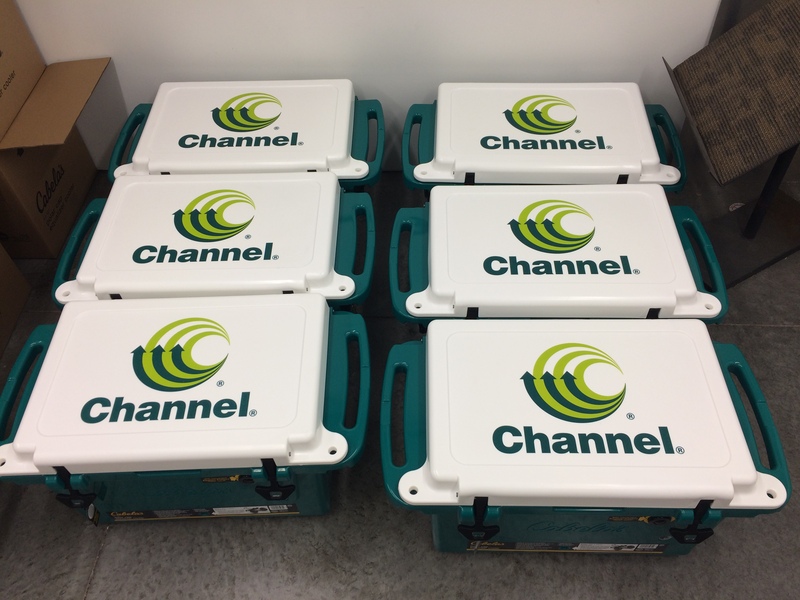 Being able to take one of our ideas and then use ingenuity and talent to bring that concept to life is really rewarding, and we get to do it on a level I didn’t think was possible for a company from around here. I’ve been very impressed by the quality standards and the efficiency at which those are achieved—all to make the client happy. It feels great to be part of that. Well, good! I’m glad you’re diving in and embracing the position and all its variety. So far, so good! On that tour, I saw everything going on and told my instructor, “I have to work here!” Kind of a dream come true in that respect. [Laughs] That’s right. I found it funny you didn’t believe it was me reaching out, like I was a Nigerian prince or something. I really didn’t know what to think when I saw the message on LinkedIn! Anything that sounds too good to be true is usually a scam. When you reached out on Facebook, it seemed more legit for some reason. The fact you even researched my Instagram account and said the samples on there made me seem like a good fit for the role made me happy—I was surprised, but it made it all feel more realistic. 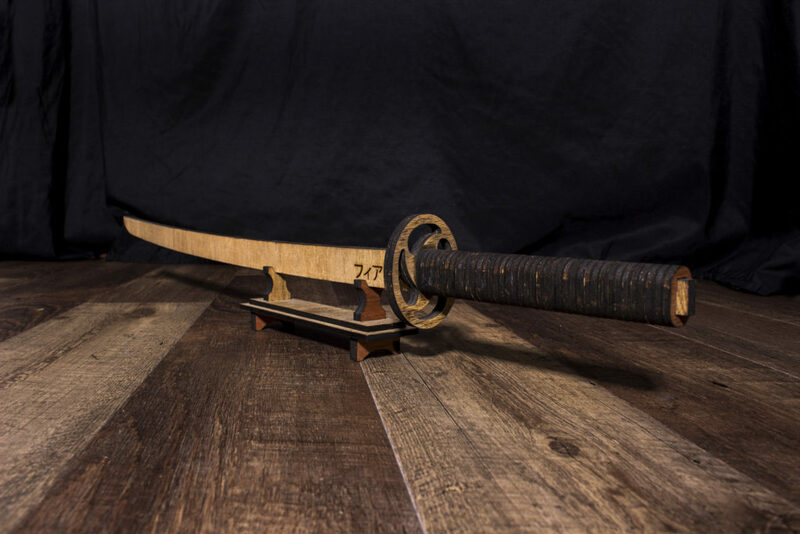 Dustin created this Japanese-style wooden sword from scrap wood and a laser cutter. I advertised that position for 11 months! Facebook, Instagram, LinkedIn, newspapers, industry associations—just about everywhere. We got some solid applicants, but the skills required for the role are pretty varied and specific, plus you have to consider cultural fit, growth potential, etc. I’ve been working in human resources for over 15 years at four organizations, and McCullough has been the most challenging when it comes to filling roles. I’m surprised I never saw the ads—I must have been outside the radius you set for them. That or you were too busy riding around on your motorcycle, Fonzie. [Laughs] I do love to ride! But it was winter, so probably not. Why don’t you tell us about that hobby? Sure! I got into bikes when I was in highschool. My dad had my brother and I learn on a Yamaha XT650. That’s a pretty big bike to learn on. He’d tell us we had to stay in first gear, but as soon as I was out of sight, I’d open it up and tear through the gears. Because I’m sure he couldn’t hear you taking off like a rocket. Right? [Laughs] Then I bought my first bike when I was about 20. A lot of my buddies are into cars and doing custom work, so I started chopping it and doing different modifications. That was a lot of fun…until it wasn’t. We were on a charity ride one day and it had just rained a little bit. I was taking off from a stop sign, and because of the changes I’d made, there wasn’t as much weight on the rear tire. Anyway, as I got up to speed I started getting speed wobble. I looked down and the speedometer said 60, and I saw no way of taming the bike, so I bailed off. Glad I had my gear on! I was fine, but the bike was wrecked. Dustin’s first bike project, a bobbed Buell. I went without a bike for awhile, but man! It gets in you. It’s too much fun. 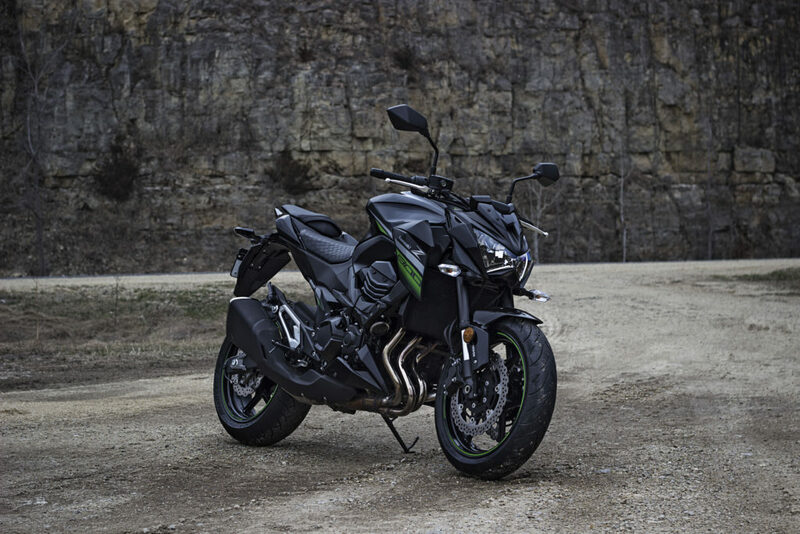 So, I just picked up a Kawasaki Z800. 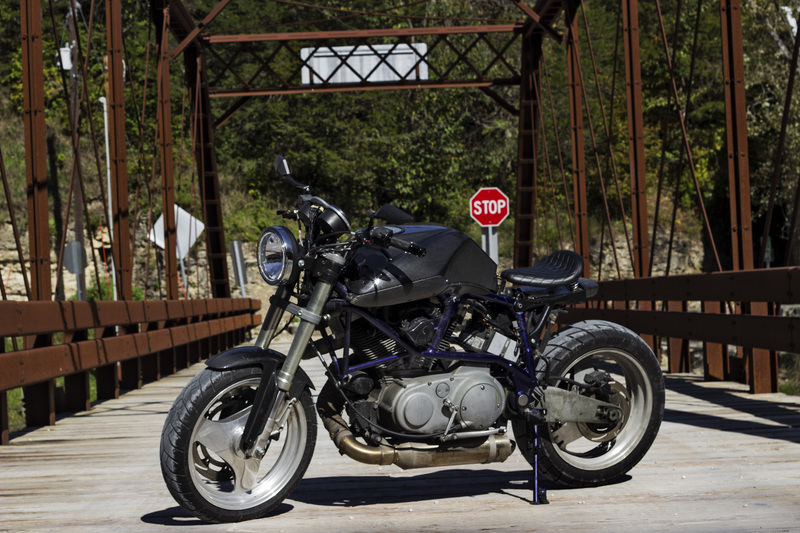 Dustin’s current bike, a Kawasaki Z800. Additional protective equipment not pictured. Yes, and more protective gear.